History plays an important role in our society. Upholding a history, like that of Deseret Book takes great care. They trusted us with developing a new look for their entire brand. Deseret Book, as a company, reflects family values and moral standards. It was imperative that the design transformation continued to reflect these values to their current customers as well as a new generation of largely female purchasers. From the first round of research RED developed three great concepts for Deseret Book. 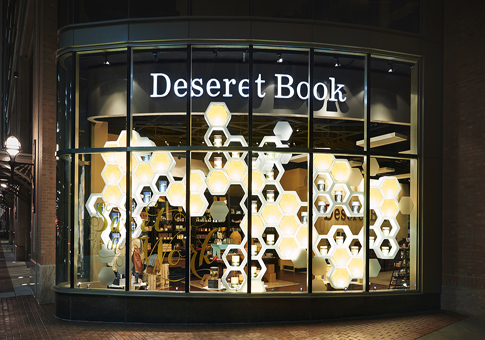 Then we took those three concepts out to the exact Deseret Book demographics that we wanted the brand to appeal to. As a group of men on both sides of the project we felt like a specific concept was the best one. But, were we the right group to make that decision? When we asked the exact age and female demographic what they liked this concept failed and another had a strong emotional following, disaster was avoided by making sure that we where listening to the right demographic group. Avoid Groupthink if that group is not the correct demographic for the product. Categories: Customer Clarity | Tags: Arts, Business, Customer Clarity, Demographics, Deseret Book, Groupthink, Joseph Smith, Literature, Marketing and Advertising | Permalink.